The chemistry, wonderment, and excitement make up this kind of love at first sight. Like the thrill of a never-ending roller coaster ride, this is the beginning of a love connection. Connections are a wonderful experience. To join with another. To love and be loved. You even love yourself even more. The connection is not as tight. What use to be there is gone. Can You get the Love Back? You can. Even when the blossoms are not in sight. Remember, you are the seed of that rose. Winter comes. Snow covers the base to prepare it for spring blooms. 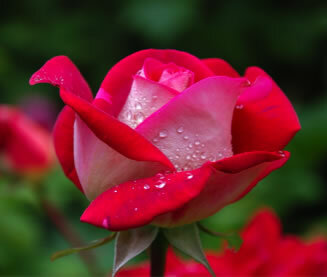 Rain and snow hydrates the earth, while the sun gives life to form the blossoms of the beautiful rose. As the rose heals, so can your injuries from the devastating loss. How nice it would be if we could just sit back, close our eyes and experience that magnificent feeling of love. A world-wind experience. It feels like something beyond this world. If you’ve experienced it, it is out of this world. It’s the first stage that can last for almost a year. It propels us into the next stage of a more mature love. Take note of your physical appearance. Is there something you need to change or improve, i.e. the way you dress or hairstyle? Take interest in how you present yourself. Like the rose, cover every detail. This may be a good time to make changes. Focus on the basics. Exercise, diet, regular checkup can make a difference. If something is feeling difficult or awkward. Ask yourself if this is something you can control. If not, let it go. The obsession of whether you’ll find your love mate can actually interfere with your objective. The obsession is something you hope for in the future rather than developing the ability to appreciate this moment. Practice breathing deeply when you are distressed. Remember what you have to be grateful for. It is easy to take things for granted. Appreciating expands joy. Joy makes you more open to receiving gifts….even the unexpected ones. There’s something about giving that make you feel like you are getting something . When you give, you receive. It comes from the heart. It feels good to give. The more you give, the more you have. Love is not easy. It takes work. It just doesn’t happen. It has to be nurtured to thrive. We can find love into different areas of our life. It doesn’t mean that one way is necessarily better than another way. Whether your spiritual love is the higher power your serve or whether it is a spiritual match, it certainly has credence in the categories of love. Love is love. Have you ever experienced “love at first site?” At that moment, you know this is the person for you. It is a powerful connection that can’t be described. Truly all the brain activities that create love come together to give you an instant romantic feeling. You have a friend or friends that you are just on the same plain in life. Even with their faults or yours, or all those annoying behaviors, you still are attached. You love your friends. Blood is thicker than water. The importance of the connection is a bond that can’t be broken. Family is the beginning of where we first experience how to love. Some love their job, or where they live. Some love their possessions and sentimental things. Some have pets, or opportunities to travel, or read. That drowns, the tender reed. that leaves, your soul to bleed. That never, learns to dance. That never, takes the chance. Who cannot, seem to give. That never, learns to live. And the road, has been too long. for the lucky, and the strong. In spring, becomes the rose. For more information on Relationship Counseling click here.